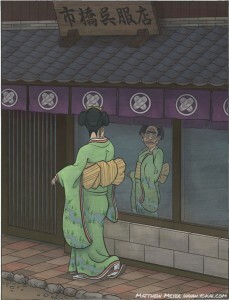 APPEARANCE: From the back, iyaya look like attractive young women wearing beautiful clothing. When somebody calls out to them to get their attention, they turn around and reveal ugly, wrinkly faces like those of old men! BEHAVIOR: Iyaya can be found anywhere. They prefer towns and roads at night where they are more likely to surprise lone travelers. They don’t do anything harmful. 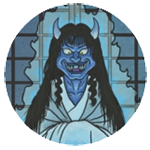 Like many yōkai, they live just to shock people. That done, they wander off to find new victims.